This is a quick and easy Vegan Chick'n Salad that tastes delicious. 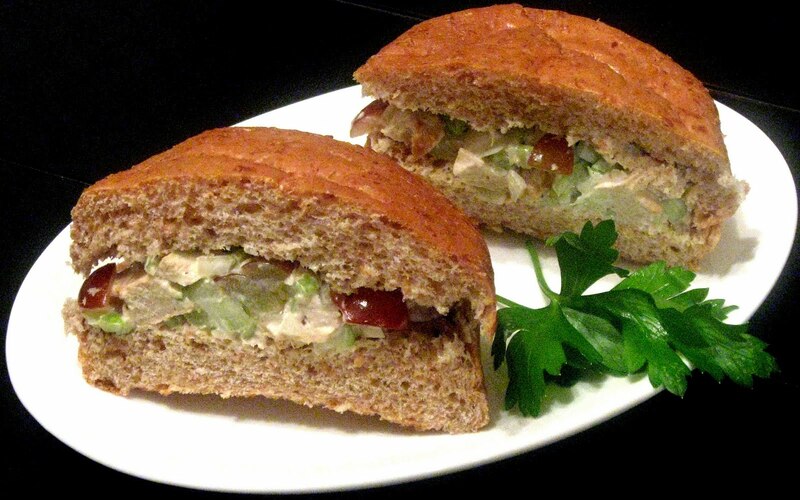 Serve on sprouted wheat buns or mound on lettuce for a luncheon dish. You will love this! Just a few ingredients-simple and healthy. Cook the 2 patties of Chick'n Scallopini in 1 tsp. olive oil (2 1/2 min. on each side). Cut-up in small squares. Combine all ingredients. Add salt & pepper to taste. Serves 4. Oh, I am SO making this one!!! It looks like the perfect wuick sandwich, tasty, and would be great to send in lunches to work with Dave as well!!! Thanks so much for the awesome recipe!!! Love the pic by the way!!! Morgan, Dave would love this sandwich in his lunch. The sprouted wheat buns were so good with it. Thanks for the positive comment on my picture-I WANT YOUR CAMERA! Heather, you have to try this sandwich with the sprouted wheat buns. I purchased the buns at Whole Foods in the frozen section. See the link above. You did great on the pic! Sorry for the typos. I HAVE GOT to start proofing before I hit send!!! I know Dave would love this, thats why I am def. making it for him! Wow! I could totally make this. I would use TJ's Chickenless Chicken Strips though cuz Gardein is too expensive.